Free Shipping Included! 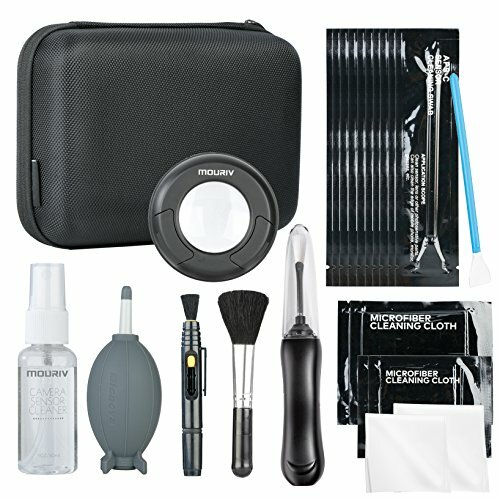 Mouriv Deluxe Essentials DSLR Camera Cleaning Kit with 10 APS-C Sensor Cleaning Fluid, Rocket Air Blower, Lens Pen, Soft Brush, 2x Small & 2x Large Microfiber Cloths & Carrying Case by Mouriv at Video Camera Authority. MPN: CCK2. Hurry! Limited time offer. Offer valid only while supplies last. The Professional Cleaning Kit Pro by Mouriv combines all the necessary tools to keep your camera, lens, and sensor free from dust, dirt, and smudges. The Professional Cleaning Kit Pro by Mouriv combines all the necessary tools to keep your camera, lens, and sensor free from dust, dirt, and smudges. All neatly packed inside a hard-shell zippered travel case. And by having these tools with you at all times, you will notice a huge improvement in the quality of your photos. Widely used for cleaning oil, fingerprints, smudges and dirt for camera lenses, microscopes, telescopes, glasses, and other precision optical lenses. 30ml of non-toxic alcohol-free formula solution. Safely and effectively removes oil, finger prints, dust from the lenses and sensors. Specially designed for optics, ultra-soft and gentle lint free microfiber leaves zero scratches, streaks or marks. Absorbs and sweeps away invisible particles and smudges. Compatible with APS-C sensors. Double headed designed, a brush and a nano-scale active carbon powder for multiple cleaning use. Water-resistant design allows you to attach the bag onto your knapsack without worrying about the sudden rain.Stores and protects all of the essential tools. If you have any questions about this product by Mouriv, contact us by completing and submitting the form below. If you are looking for a specif part number, please include it with your message.